The "Shelby" Truck and Tractor Co.
Shelby Auto tonneau touring car. Interior of J. C. Kerr Coal Co.
John Schwab Bakery - 41 East Main St.
1919 - 1926 OST Company Store 65 West Main St.
B. J. Williams home 54 Marvin Ave.
West Main at Gamble looking West. Shelby Cultimotor - built by the Shelby Tractor Co.
W. S. Anderson, M. D.
Gamble School 1931 Weidner Rd. The Browning Building razed in 1995. West side Neikirk Store. Third Church built by Presbyterians - 18 High School Ave. The Big Store - 14 Mohican St.
London School one room brick building Plymouth-Springmill Rd. Clark School off Rt. 39 on Taylortown Rd. Catholic School located 29 Raymond Ave. Etched sign on Shelby Mutual Bldg. S. R. Bloom - (Joy - Lou Tea Room) - 100 W. Main St.
W.H. May Babrber Shop - where Tresden's jewelry is in 1996 - 46 W. Main St.
R. & H. Garage on Mansfield Ave. 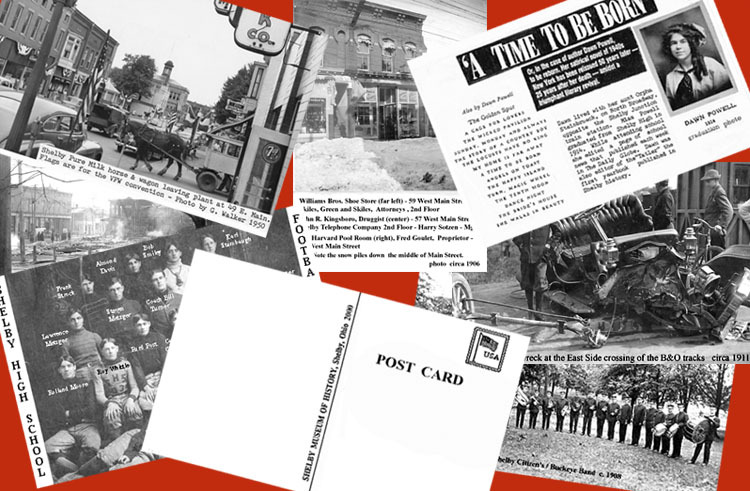 The Shelby Post cards are available at a cost of 25 cents each. The cards are sold in sets - as described above. Copyright &COPY; 2000, 2019 - The Shelby Musuem Of History, Inc.